Of Jackson, MI passed away peacefully on Tuesday, March 26, 2019 at Countryside Grand at the age of 97. Betty was the daughter of Odie Lee and Gladis Anna (Palmer) Andrews born March 26, 1922 in Oregon County, Missouri. She was preceded in death by her husband of 50 years, Leo P. Tyshko; her parents; two sisters and brothers-in-law, Thelma (Harry) Trumble and Lorene (Gerald) Morgan. She is survived by her children, Beverly A Keller and Robert (Kay) Eva; step-daughter, Joanna Johnson; granddaughter, Chantel; (Robert) Adams; three great-grandchildren, Brittney (Dean) Peterson, Jayde Adams and Robert Adams; two great-great-grandchildren, Mason Peterson and Ava Peterson; three siblings, Harold (Gloria) Andrews, Carl Andrews and Wanda Macchia. Betty was a 1941 East Jackson High School graduate. She stated her working career as a secretary for Citizens Mutual Insurance Company; then she and her husband owned and operated Pershing Ohio Company in Van Wert Ohio, which manufactured aerospace parts for Aeroquip Corporation in Ohio; retiring in 1975. Betty volunteered at the gift shop which was then W.A. Foote Memorial Hospital. 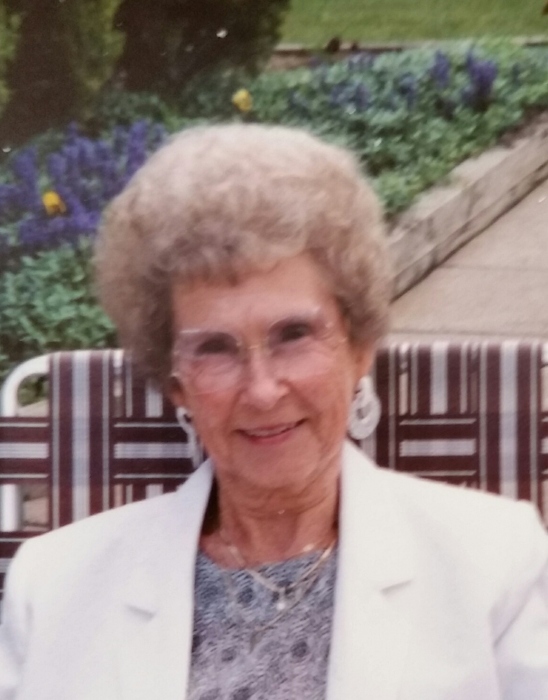 She enjoyed spending time with her granddaughter, her great and great-great grandchildren, spending time in her flower garden, sewing, and cooking. The family would like to thank special friends, Bill and Phyllis Cummings, John and Norma Macchia, Julie Foote; the staff at Countryside Grand and Great Lakes Caring Hospice for their wonderful care of mom. According to Betty’s wishes, there will be no service; interment was held at Hillcrest Memorial Gardens, Thursday, March 28, 2019 at 11:00 am. In lieu of flowers, in memory of Betty, for those who wish, contributions may be made to Great Lakes Caring Hospice, 900 Cooper Street, Jackson, Michigan 49202.